I was told every megalith was made as Stone gods who descended from Sagittarius to the earth exchanged the information with one another through telepathy. "The reason why the stones are round is that it is important to get along with each other by forming the ring. The reason why two stones were arranged two is to show Jesus and Muhammad were the twins and their relationship was good. But atoms of Stone gods knew they would be forced to contend owing to the Ruler's Stars." "You can't climb up the middle of the splited stone when the round stone which shows the ring break, can you? 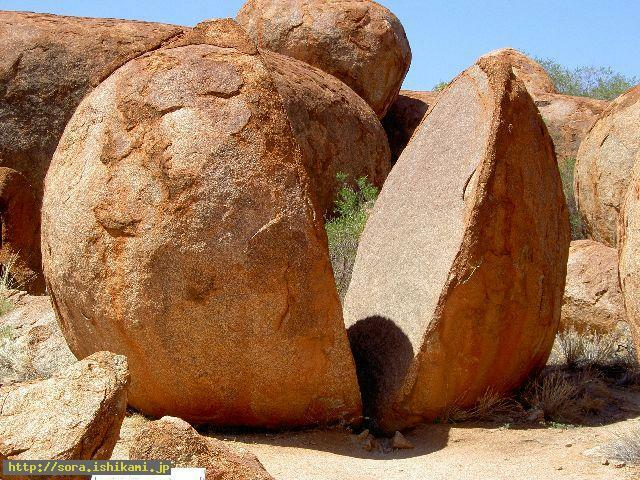 Half of the round stone can't be climbed up and the upper part of the splited stones get separated more and more. Conflict will occur is also expressed by the separation of the upper part of two stones." The megalith in the US. "Though I was told to make a high fence through telepathy by another Stone god, I made such a thing, as I didn't know the meaning why I had to make a high fence." "I was told to make gentle mountain （pyramid）and the fence." "I was told by the mates of stars that Stone gods play the role of connecting the earth and stars." It represents atoms overlap and become the cell and forms the body. Or it represents atoms gather together and materialize. I saw a vision while I was closing the lid. "The waves of white light rise many times from bottom to top. Next the waves of white light stop by in the middle from the left and right and go up and up to the top." "It represents the megaliths which were made by Stone gods are opened to public and they are able to be known by everyone. Therefore it also represents the subconsciousness （spirit ）of Stone gods were able to go back to the stars. The light seen in the vision which came from the side informed awareness of the people was also turned to the mountains in China （ the mountain whose sand cries）."